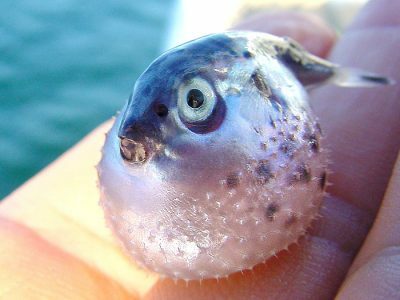 This tiny puffer fish came onto the boat in a strange way. I found it inside of a Mahi Mahi. We caught the Mahi Mahi and when I was cleaning it this little puffer came out still all puffed up. It was so cute that I had to stop and take its picture.